Although geologist are already one step ahead of many other earth-dwellers, since this filed of work is concerned with analyzing the structure of the very materials this planet is made of, in order to be more efficient in the midst of new discoveries, one must be well equipped and keep ahead of the competition. The sweet irony about geology is that they go the distance by going back in history. So unless your ambition ends at rock hounds level, here’s what tools this complex scientific field requires. In order to locate work-sites, geologists must rely on GPS systems, maps and compasses and they also use surveying equipment to map their sites. They also require safety gear which consists of knee pads, helmets, reflective vests and boots. Should it be necessary to really take it up a notch, geologists can equip themselves with entire portable field stations with computers and scanners, living quarters, and mess halls. For rocky terrains, they make use of rock climbing gear to ensure safety. For the purpose of staying organized, these earth-bound researchers rely on equipment marking products, such as permanent markers, which can be used on any kind of surface including wood, cloth, canvas, plastic, steel, iron, rubber, cardboard, glass, fiberglass and concrete ans can withstand oil, grease, rust, mud, snow, moisture, heat or cold. Containers for housing, transporting, and displaying samples are also a must for this type of work. Most of the time, basic storage containers can do the trick, however some geologists like to label each specimen with equipment marking, so their receptacles include display trays. This task includes digging and prepping tools such as rock hammers, brushes, scrapers and chisels. However, no field observation job can be complete without tools such as cameras, lenses, clipboards and notepads. In addition, geologists often make use of ground radar-based imaging technology for the purpose of getting a better picture of what resides beneath their feet. 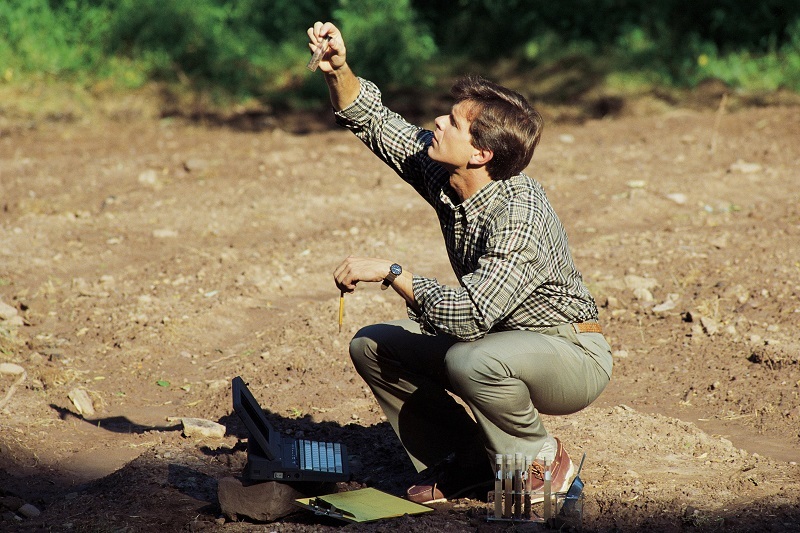 Water and soil sampling tools are also a necessity when it comes to gathering specimens to take back to the lab. Geologists usually bring their specimens to a laboratory where they do detailed examinations using various microscopes. This can be a standard compound microscopes that is used to magnify surface images or a scanning electron microscope that is used to create detailed 3-D images of very tiny particles. Less powerful lenses and loupes might also be required for examining the details of handheld samples. Finally, advanced geologists also use computer programs such as the CAD software or a photo imaging software for generating virtual models of excavation sites.